Despite the recent media storm over the possible discovery of remains of Christopher Columbus’ long-lost Santa Maria flagship, Haiti has long laid claim to one of the ships anchors. If the remnants of a long-lost ship at the bottom of the sea off Haiti’s north coast is confirmed as belonging to Christopher Columbus’ Santa Maria, it will be a cause for celebration for the underwater explorers who found it. But despite recent reports and the media storm over the possible 500-year-old find, it will not be the first time wreckage said to be from the storied flagship that led Columbus’ first voyage to the Americas, has surfaced. For centuries Haiti has laid claim to an anchor — currently on display at its national pantheon museum in Port-au-Prince — that scholars and academics say belonged to the Columbus vessel that met its demise at midnight on Christmas Day in 1492 after it lodged in a reef off the northern coast of present-day Haiti. Across the border in Santo Domingo, the Dominican Republic also claims to have one of the ship’s anchors at its Faro a Colón, a cross-shaped museum dedicated to Columbus. “The discovery of one anchor doesn’t mean that you cannot discover other anchors,” said Haiti’s Minister of Culture Monique Rocourt. Still, Rocourt and the head of the Musée du Panthéon National Haïtien (MUPANAH) say they were baffled by the global frenzy over recent news that underwater researchers had discovered, what some reports portrayed, as the fist substantial evidence linking the Santa Maria to Haiti. 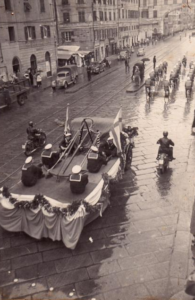 For one, there was no mention of the anchor, found in the late 1700s on a plantation in the same general vicinity in northern Haiti where the Santa Maria ship wrecked, and in the 1950s was paraded through the streets of Italy. “It’s not an anchor that has just been discovered,” said Michèle Frisch, executive director of the MUPANAH, noting that the museum has documentations to back up the anchor’s authenticity. Second, the underwater archaeological discovery on a reef northeast of the city of Cap-Haitien calls into question much of what Haitians and others, had been taught about the Santa Maria’s fate: all of its valuables were unloaded, and with the help of the local Taino Indians, Columbus had his crew dismantle the ship and used its timbers to build a fortified village, La Navidad. What he has, is a “tractor trailer load of stones on top of a coral reef in about 10 to 15 feet of water,” or a ballast pile that was used in those days to stabilize ships. He also has photos of a 15th century cannon or lombard that was next to the pile, but has since disappeared. And while Clifford didn’t acknowledge the existence of Haiti anchor’s in previous interviews — an oversight that puzzled many Haitians — he told the Miami Herald on Friday that it, too, was among several clues, “an incredible clue,” that together with others culled from Columbus’ journal entries, help further substantiate his team’s discovery. Rocourt, the culture minister, said she is anxious to examine Clifford’s evidence. Like others, she expressed skepticism as she visited South Florida last week in celebration of Haitian heritage month. For one, she questioned Clifford’s assertions that he used La Navidad’s location as a guide, saying the fort’s exact location remains a mystery despite excavations by archaeologists. Daniel Koski-Karell, an archaeologist who once thought that he, too, had found the Santa Maria’s remains while snorkeling off the Haitian coast, echoed Rocourt’s concerns. Koski-Karell said he visited the site suggested to be Navidad while it was being excavated by a team from the University of Florida in Gainesville, led by archaeologist Kathleen Deagan. He also was close friends with the late Dr. William Hodges, an American missionary and archeologist who discovered the Taino village site and Spanish city of Puerto Real, south of what is today the rural village of Bord de Mer Limonade, while searching for La Navidad. Hodges, who died in 1995, would later dismiss the site he named “En Bas Saline” as being home to La Navidad. Koski-Karell does believe, however, that the anchor inside the Haiti museum is among at least six anchors that were on the Santa Maria. He calls it “a remarkable artifact” whose configuration dates it to the late 1400s to early 1500s, making it consistent with anchors carried aboard Spanish ships of that period. “I believe it is genuinely from the Santa Maria,” he said. For Haiti, the possible discovery of what could be the Holy Grail of shipwrecks has come at a time when its government is trying to focus attention on its heritage below the sea where there are no shortage of wrecked ships, including a fleet of Europe-bound Spanish ships that wrecked in the area in 1528 during a hurricane, after leaving Puerto Real. Clifford said as his team scoured the ocean to eliminate some 450 targets, they came across other shipwrecks, including one that was “very intriguing about 120 feet away” from his Santa Maria find. Tests of the wood, however, later proved that the ship was from the 16th century. A history buff and preservationist, Rocourt has long been fascinated with Columbus and the period before Haiti’s 1804 independence. She worked for years with Haiti’s Institute for the Preservation of National Heritage (ISPAN) as both a consultant and director, before her recent appointment to head the culture ministry. Caution aside, the global attention Haiti is receiving, she said, has piqued interest in a period of the island’s history that few know. “We have a tendency in Haiti to consider our history often starts in 1804 after the victory we had,” she said. “We tend to forget that this is a history of a land, not just of each persons that brought their own participation in that history. Barry Clifford is a flim-flam artist. I can remember when he tried to get into a project near Isle a Vache. At that time a local diver/salvage operator told of him “salting” a site with artifacts from somewhere else so that the place would look like it had good potential. He is a publicity seeker who will do nothing to the benefit of Haiti. Watch him in action as his ego prevent an appearance in public sans baseball cap. He is ashamed of his shiny bald head. I hope Prime Minister Lamothe sees through this guy.